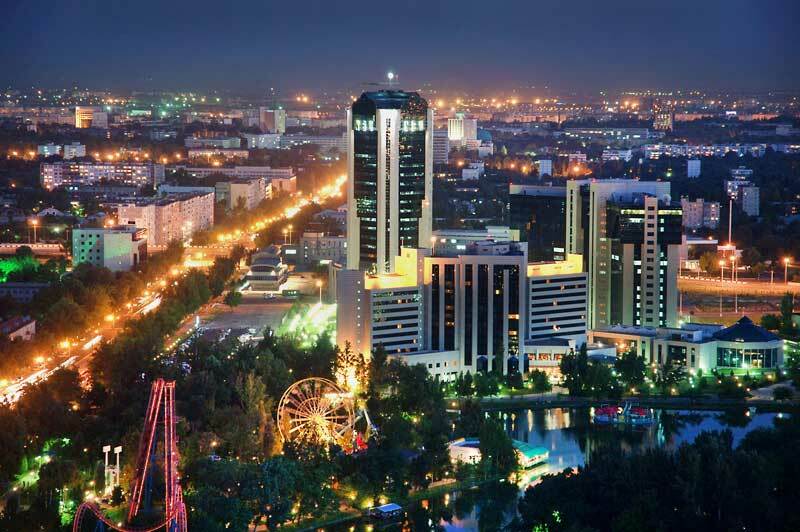 Tashkent is the most beautiful, modern and very green city with gardens and parks. It is the administrative centre of Tashkent region located in the Chirchik River Valley. The State Museum of Fine Arts is one of the largest museums in Central Asia which was founded in 1918 on the basis of small collection of 500 specimens. Mostly the exhibits were the works of Russian and West-European art – painting, sculpture, art furniture, porcelain and bronze. The museum exhibits the most valuable specimens of antique and early medieval art of Uzbekistan, architectural décor, embroidery, carpets, clothes, brass engraved products, golden embroidery, jewelry art etc. The exposition of Uzbekistan fine art shows complex and unique way of National painting forming and development during more than century-long history. It is possible to see the works of I. Kazakov, I. Karazin, R. Zommer, A. Volkov, A. Abdullaev, R. Akhmedov and others. The art of abroad East is represented by art works of China, India, Japan, South Korea and Iran. There is a big collection of Russian art works of 15-19 cc. – collection of icons, fine art of 18th century (I. Nikitin, F. Rokotov, D. Levitsky, V. Borovikovsky etc.). The art of 19th century represents canvases of A. Orlovsky, O. Kiprensky, L. Plakhov, V. Perov, G. Myasoedov, N. Kramsky, I.Shishkin, A. Savrasov, I. Levitan, I. Aivazovsky, I. Repin etc. There is also collection of works of Russian artists of 19th-20th cc – “Russian avant-garde”: A. Benua, V. Serov, K. Korovin, V. Kandinsky, K. Malevich. The art of Western Europe is represented by fine and applied art of Italy, Spain, Germany, Netherlands, France, England and others. The monument of Courage built in a memory of terrible earthquake victims in 1966 takes a special place among numerous monuments of Tashkent. The earthquake started at 05:33 am on April 26 in 1966 with magnitude of 8 points and its epicenter was in Tashkent. The disaster destroyed more than 2 million square meters of living area, 181 educational institutions, 700 trade objects and catering places. General number of destroyed buildings reached 1000 units. People from all countries of Soviet Union came to help and soon the city was reconstructed. The memorial complex known as Monument of Courage was erected near the Independence Square on the estimated place of epicenter in a memory of event in 1970. The sculptor of memorial is D. Ryabichev, architects – L. Adamov and S. Adilov. The memorial consists of two monuments: the first is black cube on the granite podium. The clock face with hands stopped at 5 and 24 numbers is carved on one side of the cube and the date April 26 of 1966 on another. There is a crack in the middle of the cube which symbolizes the rift of earth crust. The crack stretches to the foot of the second monument which depicts family – father, mother and little baby in mother’s hands. Father courageously covers mother with breast and she embraces the child trying to protect him. The half of a century passed but nevertheless people of Uzbekistan didn’t forget this event and victims. Zangiota mausoleum was constructed in 14th century by the order of Amir Temur. In the beginning of 19th century the mausoleum became the center of complex, which consists of Namazgokh mosque (1870), minaret (beginning of 20th century), madrassah (end of 19th century), necropolis and Ambar Bibi mausoleum. “Zangiota” from Uzbek language means “dark father”, that was the nickname of Sheikh Ai-Khodja - the descendant of Khazrat Arslon Bobo. Sheikh Ai-Khodja was the fifth murid of sufi Akhmad Yassavi, which is called as a spiritual ancestor all of Turkic tribes in Central Asia and Kazakhstan. There is a very interesting legend related with the mausoleum: “Amir Temur ordered to build a mausoleum in honor of saint muslim Akhmad Yassavi, but the walls started to ruin and the process didn’t move. Then Amir Temur saw a dream where Akhmad Yassavi advised him firstly to build a mausoleum in honor of Zangiota and walls didn’t ruin any more”. The building was completely and successfully constructed. Later the mausoleum of Yassavi and the mausoleum of Zangiota Ambar Bibi were built too. The entrance in complex lies through darvazkhona – portal-domed construction (6x7 meters). The alley from the gates is 22 meters in length. All buildings are made of red and orange brick and decorated with blue and white mosaic. The majestic Square of Amir Temur is located in the center of the capital. In recent years there was formed the unique ensemble: “Uzpromstroibank” building constructed in 1895, two buildings of Tashkent State Judicial University constructed in 1879, Tashkent chiming clocks (one of clocks is built in 1947 and another clock is built in 2009), Palace of International Forums (opened in September of 2009), “Uzbekistan” hotel located next to Palace of Forums and Temurids Museum built in 1996. There is also Tashkent department of State Bank of Russian Empire which was founded in 1895. During 100 years of existing there were only financial institutions in this building and nowadays there is also a bank in this building. Temurids Museum. In Temurids Museum, which is located not far away from the monument of Amir Temur, it is possible to get know about the conqueror and his descendants – representatives of Temurids’ dynasty. The collection of the museum is worth seeing as well as the architectural style of the building, which represents all grandeur of the East. The buildings of Tashkent State Judicial University. These buildings which were constructed in 1875-1979 originally were two-storey. There were men’s and women’s gymnasium from the moment of its construction until the 1920th. In 1930th there was built the second floor and buildings were given to Central Asian University, and then to Road Transport Institute. Nowadays these are the main buildings of Tashkent Judicial University. Chiming clocks. Tashkent chiming clocks became the symbol of the city. The first clock was built in 1947 in a memory of 430 thousand soldiers who died in fronts of Second World War. The second were built in 2009 to the 2200th anniversary of Tashkent city. The Palace of International Forums. Majestic and one of the most beautiful buildings in Tashkent and even in a whole Uzbekistan built in 2010 became the place for the most important events and meetings of the country. The crystal chandelier which is visible from outside is one of the biggest chandeliers of the world. “Uzbekistan” hotel. This is one more symbol of Tashkent which became so because of unique architecture and unique design. It looks like a big opened book. All these buildings are united by the Amir Temur Square with the monument of conqueror in the very heart of Tashkent. Sheikh Khovendi At-Takhur (Sheikhantaur) mausoleum was built in 14th century. The construction is 13 meters in height and 17 meters in width. It was constructed especially for Sheikhantaur burial. Sheikh Khovandi At-Taur which is well-known as Sheikhantaur was born in 13th cent. He belonged to the Mukhammad’s tribe – Kuraish. Khovandi At-Takhur was the direct descendant of Omar Al-Khattab khalif and that’s why he wore the honorable title – Khodja. According to the legend after meeting with famous Sufi Akhmad Yassavi he chose his burial place near the holy wellspring himself, where he had been living greater part of his life. The wellspring is a legendary place as it is considered that there was Zoroastrian temple of Fire and Water before Arabian invasion. Earlier Alexander the Great (Iskander Zulkarnai) had a rest here. There were growing the Sauras of Alexander (millennial petrified trees) and one of them remained till present time and now it is placed inside the mausoleum. Sheikhantaur died in the middle of 14th century in Tashkent. The mausoleum was built later by the order of Amir Temur, who himself liked to spend the time in the shadow of the trees near the spring of eternal water. Sheikhantaur is considered as one of the most respected and greatest sages of the East and one of the founders of Naqshbandi Sufi order. Eventually there was formed the whole complex. In different time there were buried Yunus Khodja – the ruler of Tashkent in 18th century, when the city was half independent state, Alimkul Parvachi – general, who fought against Russian troops in the middle of 19th century, etc. At the beginning of 20th century there were 16 buildings around the mausoleum, but nowadays only 3 of them remained: Sheikhantaur Mausoleum, Kaldirgochboy Mausoleum and Yunus-Khan Mausoleum. The district, which is adjacent to the complex, is named Sheikhantaur. The remote descendants of Sheikh still live in Tashkent. Barak Khan Madrassah was built in 16th century on funds of Tashkent ruler Navruz Akhmed who is known as Barak Khan. Nowadays this is the oldest educational institution in Tashkent. Though this madrassah is not used appropriately, it attracts attention by its architectural style unusual for Tashkent and well-preserved work of architects of that period. The madrassah was built on the territory of mausoleum in which the burials of Tashkent rulers were kept. Later there was built Khanaka (two dome mausoleum) in 1530. In 1541 the madrassah was built in mausoleum. The complex was completely reconstructed into madrassah and named in honor of Barak Khan after his death in 1556. The madrassah has the second name – “Kok-Gumbaz” similar to blue domes crowning the construction. There was an inscription around the dome lined by colored majolica. The inscription was taken from the poem dedicated to the beauty of Tashkent and it was written by the famous oriental poet Zainiddin Vasifi. Unfortunately nor blue dome neither inscription remained till present days because of earthquake in 1869 which damaged the building. The madrassah was restored by the well-known academic Usta Shirin Muradov in 1955-1963. It was impossible to restore the dome, but Usta Shirin could restore “peshtak” (entrance) including inscriptions, where the date of construction was encrypted, “kolab kori” (niche), timpanas (the inner field of the pediment) and support in original form. In present time the Barak Khan Madrassah is a part of Khast-Imam complex and it is the residence of the Committee of Religious Affairs of Republic Uzbekistan. Sheikh Zainudin Mausoleum is situated in Kukcha ancient district in the historical center of Tashkent. Sheikh Zainudin lived approx. in 10th – 11th centuries; however the mausoleum was built much later – in the period of Shaybanids’ ruling (16th cent.). Now there was formed the whole complex. Beside the mausoleum there is chillakhona (underground cell) built in 12th century, chartak (passage) dated back to the same period and repaired in 14th century by the order of Amir Temur and one of the largest mosques of the city built in the end of 20th century. Sheikh Zainudin was the son of the Sufi Order founder Sukhravardiya Djakhima Sukhravardi. He spent the greater part of his life in chillakhona, which remained till present days. Sheikh Zainudin, his descendants and followers of the Order were buried in this mausoleum. The complex differs from other monuments of Uzbekistan by curious features. First of all chillakhona is represented as observatory. During the researching of ports in lower and upper dome, there was established that if we will connect them by straight line it will be placed in a plane of Tashkent meridian. In spite of that in 12th century there were vague ideas about astronomy, niches which are showing the direction of eight points of the compass. The second is that there were turbans on the pedestals over the tombstones, what doesn’t match with traditions of Central Asia. There is an opinion that it was done so as a symbol of respect to Zainudin – Arabian man who was born in Bagdad. The third is that mosque built in 90th of last century doesn’t look like Central Asia mosque, as there was used Egyptian architectural style. The mosque in Medina, where Mohammed prophet was praying, looks like it. Nowadays Sheikh Zainudin Mausoleum is one of the most ancient Sufi monuments in Asia. Mui Mubarak Madrassah was built in 15th century and it was reconstructed several times. Mui Mubarak Madrassah is the part of Hast Imam ensemble along with Barak Khan Madrassah, Khazrat Imam and Tilla Sheikh Mosques. Here is placed the legendary Koran of Osman - big holy book; according to the legend the spots of blood of Khalif Osman bleed through the book, as he was killed during the Koran reading. The age of Koran is 14 centuries. Amir Temur brought Koran of Khalif Osman in Samarkand in 15th century and it was there until 19th century. After the Russian conquest it was brought to Saint Petersburg where scientists orientalists defined the age of manuscript (beginning of 13th century). The holy book was returned in Tashkent only in 1921. Today everyone can see Koran which is one of the most valuable in Islam as well as for whole humanity. Tilla Sheikh Mosque built in 19th century was the main mosque in Uzbekistan for a long time. It was constructed opposite the Barak Khan Madrassah by the order of Mirza Akhmed Kushbegi Khan and it is the part of Hast Imam Complex. The mosque represents longitudinal construction with rectangular plan and 12 domes. There are prayer rooms (summer and winter), short minaret and library. “Tilla Sheikh” means “Golden Sheikh” in Uzbek language, as according to the legend here is kept the golden hair of Mukhammed prophet; however, this hair is not shown to visitors. The mosque is still opened for visitors. - Modern works of Uzbek folk art decorated with patterns of various colors. The construction of the museum is the sample of unsurpassed mastership of architects and decorators of 19th century. The walls of the hall are decorated with ornamental gypsum carving and the wooden ceiling with wonderful painting. Besides, there are two souvenir shops on the territory of museum, where you can buy wonderful works of modern Uzbek masters and to take piece of unique and unforgettable Uzbekistan with you. State Academic Opera and Ballet Theatre named after Alisher Navoiy is considered as national heritage of Uzbekistan and center of theatre-musical culture. More than 8 decades the theatre shows its professional skills, creates unique and unrepeatable samples of national musical and scenic art. The history of formation the theatre originates since 1920-th, when the talented national artist of Uzbekistan – Mukhiddin Kari-Yakubov organized professional concert-ethnographic ensemble. He collected talented actors from all over the country and rallied unique national and creative team. The members of ensemble later became laureates of state prizes and made a big contribution in the development of cultural life in Uzbekistan. On the base of this creative group there was created Uzbek State Musical Theatre under the direction of M. Kari-Yakubov in November of 1929, which combined the art of vocal, dramaturgy, choreography and other kinds of art. The ensemble became popular quickly on motherland as well as abroad – in France, Russia, Egypt, England and in many other countries. In 1959 the theatre was awarded as “Academic theatre” for the great contribution in musical-scenic art development and in 1966 it was awarded as the “Big” theatre. Since that time the theatre justifies its majestic name deservedly. The theatre exists more than 80 years. Many people worked there and each of them left a small or big legacy, but everyone must remain in a memory. Nowadays the theatre is a long and painstaking result of work of many people who had one aim worthy of respect. The State Academic Big Opera and Ballet Theatre named after Alisher Navoiy – is a unique, distinctive and incomparable part of Uzbek culture. The main square “Mustakillik” – is one of the most relevant sightseeing places of Uzbekistan and favorite place of rest for locals and tourists. All visitors are met by the majestic colonnade - “Ezgulik” (the arc of kind and noble aspirations) – the sixteen marble columns stretched for 150 meters are immutable and unbreakable; the storks soar up in the deep blue sky above the column, where the storks symbolize peace and harmony from the ancient times. The white road leads from the main arc to the center of the square, where stands “The Monument of Independence and Humanism” – a large bronze bowl with the depiction of Uzbekistan borders. The monument impersonates freedom, perspectives of state’s development and readiness to partnership with other countries. There is a “Monument of Happy Mother” situated at the foot of the monument of “Independence and Humanism” – a young woman with the child in her hands, which embodies the image of motherland, wisdom and hope. Recently a new tradition of newly married couples occurred – newlyweds walk on the white path “Oq yul” (“Good Luck”) and lay flowers to the foot of the monument. The left part of the square is surrounded by administrative buildings – majestic building of Senate (the upper chamber of Parliament), the Cabinet of Ministers and government institutions. The right side of the square represents a woodland park area with the Memory and Glory alley in the center. The galleries located on both sides of the alley and decorated with carved granite. There are placed the Books of Memory on 14 steles (the number 14 matches with number of regions of the country) with the names of those who died on the fronts of Second World War, which are listed on the pages of these books. The alley ends by symbolic Eternal Flame with the monument of Grieving Mother nearby and there are fresh flowers lying at her feet in any season of the year.